It's true that Latin American startup entrepreneurs are finding success by looking north to Silicon Valley for investment, mentoring and inspiration. But there is another side to this story. There are a number of entrepreneurs from the United States (and other parts of the world) who are looking south to Latin America for opportunity, talent and growth. Why? There are a couple of strong underlying trends -- like more stability, better education and faster economic growth -- but a big reason is the success of Start-up Chile, a government initiative that is changing the face of entrepreneurship in Latin America. So, how can one government initiative which has existed for less than two years already be considered a success, let alone responsible for changing the entire region? Start-up Chile is a bold, disruptive program (very rare in government these days) that is putting its money where its mouth is. Its goal is to convert Chile into a hub of innovation and entrepreneurship. To this end the Chilean government is providing $40,000 of seed capital, office space and a one-year visa to early-stage entrepreneurs who come and start their businesses in Chile. So far it's working. In just two and a half years years the program has hosted 687 entrepreneurs from 35 countries, created 695 jobs and sparked 36 deals with Chilean investors, according to Forbes.com. Around 59 percent of Start-up Chile entrepreneurs now have operations in Chile. The Chilean government correctly understands that in order to reach the next stage of development the copper-based and risk-averse Chilean economy needs to innovate. Global innovation hubs like San Francisco, New York, Tel Aviv and Bangalore demonstrate that attracting creative and innovative people is key to economic success. Like the rest of Latin America, Chile needs innovators. In return for the $40,000 and free visa, the Start-up Chile participants are required to engage with Chilean students and entrepreneurs. In many cases they end up mentoring or hiring Chileans. The influx of foreign innovators has disrupted the status quo in Chile and introduced a new generation of entrepreneurs to opportunities in Latin America. Carlos Solorio who runs Arden Reed, an online menswear retailer, arrived in Chile three months ago and has already decided to develop his company's tech base in Latin America. Start-up Chile has helped him connect with the designer community in Argentina, where he has made three hires. The design and engineering talent in Latin America is "remarkably high" and undervalued, he says. Jeff Thelen, an American entrepreneur based in Bogotá, is using Start-up Chile to connect with other entrepreneurs and build his contact network in Latin America. Thelen started the website Edmond.com.co with his brother Mike to provide personal finance information and eventually financial products to Colombian and Chilean consumers. Both Solorio and Thelen were attracted to Latin America because of its increasing economic and cultural dynamism but Start-up Chile provided them with the funding and connections needed to stay and build their businesses in the region. Start-up Chile is creating an entrepreneurial ecosystem—the all-important support network that provides resources and inspiration to early-stage entrepreneurs, which is linking Latin American designers, engineers and innovators and connecting them to the global startup movement. 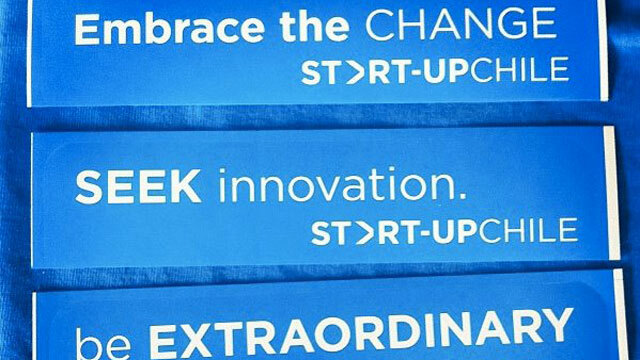 Start-up Chile has also become a solid brand that is changing perceptions of Chile and Latin America. The initiative has inspired a number of spinoffs (including Startup America, Britain, Greece, and Italy) and put Latin America on the map as a place to start a business. Entrepreneurs from across the globe have travelled thousands of miles to come to Santiago to connect with other like-minded innovators. On Monday Start-up Chile closed its sixth funding round receiving 1,421 applications from 60 different countries. Applications came from top academic institutions including Harvard, MIT, Columbia University, and Oxford. But perhaps most telling this time 50% of the applicants are from Latin America.